This one is close to my heart! We’ve worked on the Beestonian free of charge for a number of years and it’s always been a privilege. The Beestonian is a fantastic project made possible by a collection of very talented, passionate people. The content has always been top-notch, but it needed a design to match. A successful funding bid has enabled us to redesign the entire brand from top to bottom, starting with a new logo and strapline. We’ve now re-formatted the magazine to give it a consistent and professional template. And, helping the team source a really great litho printer who could give it the professional finish at a great price was the finishing touch. So now the magazine feels as good as it looks! The magazine has a great new look, but still retains its indy roots. 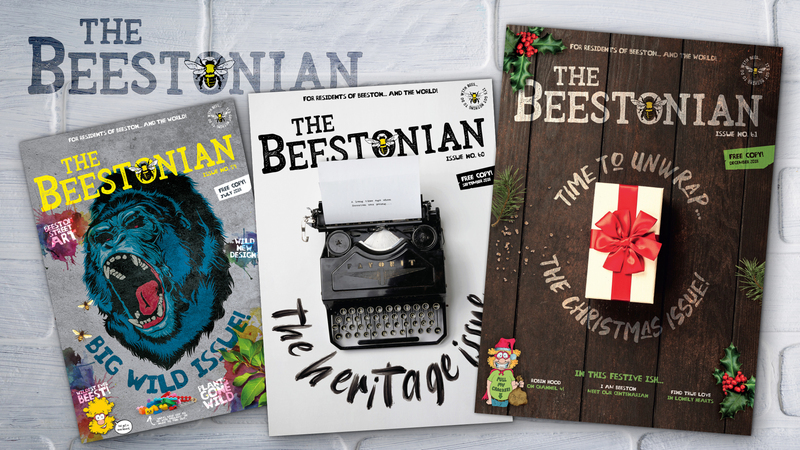 The Beestonian team are now working with us on building an extended range of promotional products (badges, banners and T-shirts so far) as well as a great new website design – so we’d better get going… Lots to do! The Beestonian is independent in all ways so if we say we like it, we really mean it. You’ll find magazines in good Beeston coffee shops, pubs and other places we love. Are you interested in Graphic Design? Check out our design page here or get in touch today. We’d love to hear from you!